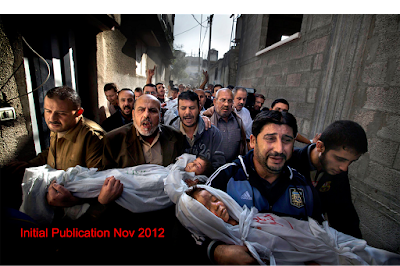 We have reviewed the RAW image, as supplied by World Press Photo, and the resulting published JPEG image. It is clear that the published photo was retouched with respect to both global and local color and tone. Beyond this, however, we find no evidence of significant photo manipulation or compositing. Mouse over this image to compare Paul Hansen’s originally published photograph with the edited version he submitted to World Press Photo’s annual competition for best photojournalism image. Indeed, when I was pondering this issue yesterday I wondered whether the World Press Photo foundation had always allowed photographers to edit their published photographs before submitting them for its award (which, according to the WPP website, has been issued since 1955). In one sense, Hansen’s photograph is brutally authentic. It captures unflinchingly an event that actually happened—and does nothing as baldfaced as combining images, distorting its subjects’ intentions, or digitally airbrushing out distracting persons or objects. In another, however, it artfully dials down the visual temperature of the alley in which it was shot, clarifying certain faces to highlight their sorrow and, because its subject is death, draining the inappropriately vivid color from much of the image—especially that of the dead children who are central to its power. You might say the photograph has been manipulated only enough to improve upon its capacity to manipulate us. And that such manipulation has been the stock in trade of photojournalists for as long as they’ve carried their cameras. While writing about this controversy—and the willful manipulation of images—I was reminded of another concerning a wartime photograph. But this controversy centered on a pair of images shot over a century and a half ago, during the Crimean War, by the English photographer Roger Fenton. In 2007 the documentary filmmaker Errol Morris, contributing to the New York Times’s Opinionater blog, set out to settle a dispute that had long simmered among photographic scholars and curators, namely: which of these photographs did Fenton take first? It’s worth noting that Fenton’s photograph depicting the cannonballs scattered across the road is by far the more celebrated of the two images. (And worth it to wonder, as Morris did, why Fenton chose to shoot two nearly identical photographs of the same scene, as if his conscience insisted he document the landscape both before and after he altered it.) Photographs courtesy of Morris’s NY Times Opinionator blog. 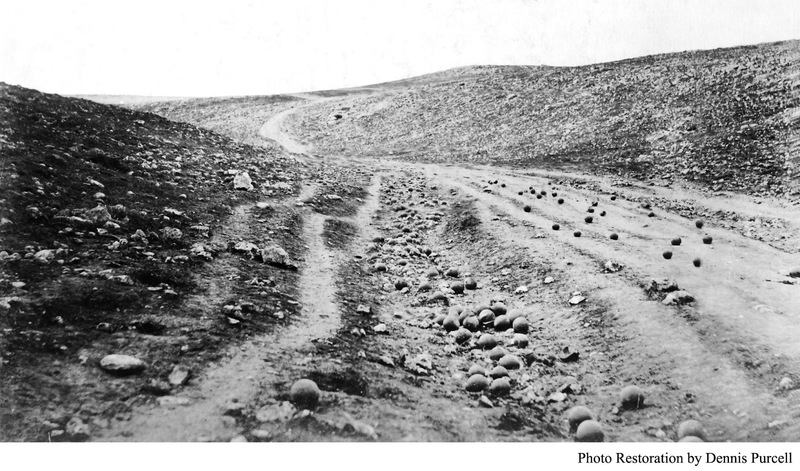 Morris explains that he was inspired to investigate this puzzle after reading Susan Sontag’s Regarding the Pain of Others, in which Sontag criticizes Fenton for staging the photograph that shows the cannonballs scattered across the road. Wondering exactly how Sontag could know which photograph Fenton had taken first—and preferring to find physical proof that wouldn’t rely on Sontag’s (or our) assumptions about Fenton’s motives—he devoted 25,000 words, visited the very site in the Crimea that Fenton photographed, and talked to a number of photographic and technical authorities to try to arrive at a reasonably objective conclusion. In the end he relies on some compelling analysis by Dennis Purcell, a man he refers to as an inventor and friend. 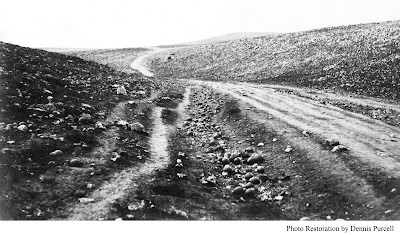 Purcell performed a meticulous comparison of the shots and noted that several rocks visible in both images have migrated downhill between the shot taken without cannonballs on the road and the shot taken with them. Purcell’s conclusion, which Morris embraces, is that whoever moved the cannonballs accidentally kicked and displaced a number of rocks while picking up and resituating the spent projectiles. Gravity, according to Purcell, betrayed Fenton’s secret. I’ve borrowed the HTML Neal Krawetz used to produce the mouseoverable versions of Paul Hansen’s photograph and applied them to Dennis Purcell’s restorations of Fenton’s images. 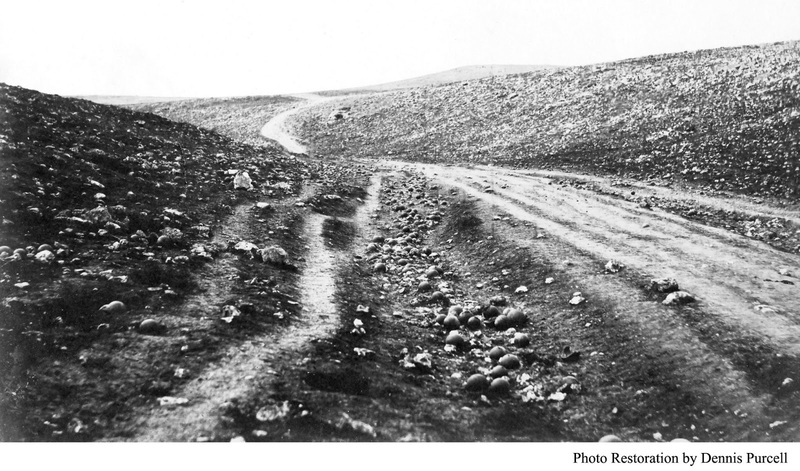 You can compare both of Fenton’s photographs by mousing over this image of the road without cannonballs. I find it interesting that the image with the cannonballs on the road has been printed lighter to enhance the visibility of all the cannonballs—especially those in the gully on its left. The cannonballs should have, could have been there, but Fenton altered the landscape by removing them. Couldn’t you argue that every photograph is posed because every photograph excludes something? In every photograph something is absent. Which brings me back to Paul Hansen and his photograph. You might say that Hansen sought to reintroduce something that was excluded in his original photograph—death’s ashen face, held back by life’s inconvenient riot of colors. And that Fenton, despite the primitive technology at his disposal, was among the first to practice the same photojournalism Hansen practiced: to use the camera to make the horror of war immediate, harrowing, and authentic for an audience eager to experience it secondhand, at a safe distance and a great remove.